For adults with crooked, crowded, or gapped teeth, we’re ready to offer a number of solutions that can give you the results you want without the hassle or timeframe required with traditional metal braces. In less time than you think, we can give you a perfectly straight smile, and you won’t have to alter your diet or worry about your daily appearance during the process. It may sound too good to be true, but it’s part of what we do here every day at Dental Designs of New England. To schedule a consultation and start getting the straighter smile you’ve always wanted, contact us today. 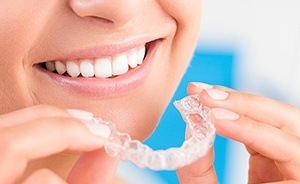 Invisalign® Clear Braces completely do away with noticeable brackets and wires to straighten the teeth using a series of crystal-clear aligner trays. They are practically invisible on the teeth, and when it’s time to eat or brush, a patient can easily take them out. This is the perfect option for the modern working adult who needs orthodontic treatment but doesn’t want to compromise their professional appearance. Even better—Invisalign® Clear Braces have been shown to work faster than traditional braces as well. For those looking to get an impeccably aligned smile in the quickest way possible, let us introduce you to the aptly named Fastbraces®. What makes them so fast? 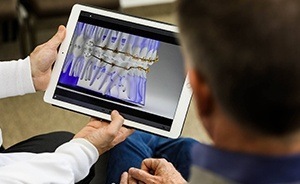 Unlike traditional braces, they actually move the crowns and roots of the teeth at the same time instead of in two different phases, meaning they’re able to deliver final results in just a fraction of the time. From beginning to end, most treatments last about 12 months or less, which sounds a lot better compared to the 2-3 years regular braces need! If you just have minor alignment issues with your front teeth, then Six Month Smiles® can make them disappear in record time. This treatment works similarly to traditional braces, but it’s only applied to the teeth that prominently show in the smile. Because fewer teeth are being moved compared to a regular treatment, they shift much faster, all without the need for additional force. In just six months or less, we can achieve a dramatic cosmetic improvement that will last a lifetime. In order to help our patients complete their orthodontic treatments as quickly as possible, we’re happy to offer Propel. It works by making tiny perforations in the bone surrounding the teeth (after a patient is numbed), and this enables them to move much, much faster. 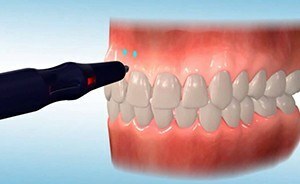 With Propel, we can often shave an entire third off of a patient’s expected treatment time! Using Propel is painless, only takes a few minutes, and it will make your treatment fly by faster than you can believe.